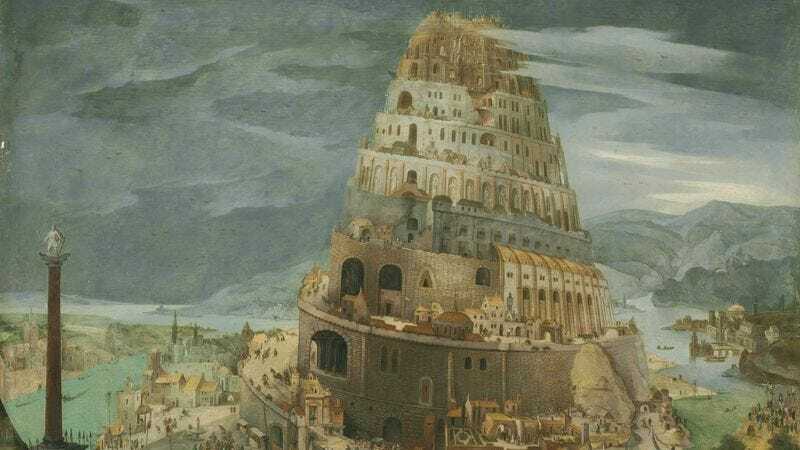 If you went to Sunday school, you know the story: After the Biblical flood, the people of earth came together to build the mighty Tower of Babel. Speaking with one language and working tirelessly, they built a tower so tall that God Himself felt threatened by it. So, He fractured their language so that they couldn’t understand each other, construction ceased, and mankind spread out across the ancient world. We’ve come a long way in the few millennia since then, and at this point, humanity could totally pull off the Tower of Babel. Just look at the feats of human engineering we’ve accomplished since then: the Great Wall; the Golden Gate Bridge; the Burj Khalifa. And don’t even get me started on the International Space Station. Building a single tall building? It’d be a piece of cake. With American steel and modern know-how, we could get this thing up past the clouds in the better part of a year, easy. God wouldn’t even see us coming. Plus, how many people could possibly have been working on the original? Even if it was everybody everywhere, that’s still only, what, 50 million folks? Heck, we almost have that many in Tokyo alone! Can you imagine if everyone in Japan came together to build the Tower of Babel? They would absolutely knock it out of the park, I think! We probably wouldn’t build it in Japan, though. We could do it in Qatar, where they’re pretty lax about codes and permits and all, though it would certainly be quite the feather in America’s cap for us to have it at home. At the end of the day, though, it’s really just about it getting built at all. Which, I hasten to add, would be no problem. We could rent it out as office space. Just a thought. Frankly, I don’t think I even need to go into how far materials science and construction technology have come since antiquity, but needless to say, we wouldn’t be stacking stone bricks. I read somewhere that the original tower topped out at only 300 feet. All those people, all that work, and that’s what they ended up with? That’s not even the tallest tower in Cincinnati! With American steel and modern know-how, we could get this thing up past the clouds in the better part of a year, easy. God wouldn’t even see us coming. I’m not saying we have to get this tower made. I’m not saying we’re going to make this tower made. But if all 7.1 billion people came together with a few steel beams per family, could we get this tower made? My friend Garret who works in construction says probably. And personally, I think that’s something we can all be proud of.